Healthy cells lead to healthy tissues; healthy tissues lead to healthy organs; healthy organs lead to healthy systems; and healthy systems lead to healthy body. Hence, the health of the cells is essential for a body to be healthy. NONI, being the best nutritional supplement works at this root level in order to make these functional units healthy, and thereby make us live healthier. Every cell in the body is like a house with doors and windows. When you have have to drive a car into a garage you need to open the large door. The same goes on in our body if we have to absorb a larger protein molecule, we need to open a larger pore if we are to use it. Our cells are made up of micro-particles which are genetically engineered to work well in a chemical-free environment. But because we live in a chemically polluted environment, many types of toxins and pollutants are going into our body. They wrap the cells day by day forming multiple layers around the cell walls, thus lead to the closure or shrinking of the pores of the cell walls. Consequently, the inter-cellular communication is prevented, the cells are damaged and they forget their purposes; they neither do their regular functions correctly nor efficiently. NONI, being the powerful De-toxifier removes the toxic layers on the cell walls and it enlarges the pores of the cell walls. This enlargement allows for larger chains of peptides to be admitted into the cell and to feed us better. If these chains are not used they become waste and this precious source of energy is lost by going to fat or being eliminated. But because of Noni's detoxification process, the cells resume their communications; are reminded of their purposes and they are rejuvenated with greater strength and life. Now the cells are able to assimilate the nutrients easily. They are strengthened and healed at their roots. This is the basis of Noni's cellular activity that causes the enhancement. Thanks to Dr. Ralph Heinicke who found out that Morinda citrifolia fruit is a rich source of large molecules called Proxeronine. Proxeronine combines with enzymes in the body to form an essential substance known as Xeronine. Once Xeronine is formed, it combines with many proteins in the body that require Xeronine to function. Not all proteins, but many vital proteins acting as hormones, antibodies and enzymes need Xeronine to carry out their duties. What do proteins do and why are they important ? Proteins give structure to hair, skin and bones. They allow the transport of chemicals and nutrients through the cell membrane. Proteins also act as antibodies and incapacitate foreign body invaders. They also act as enzymes and facilitate all chemical production in the body. Many of these proteins cannot function without Xeronine. For that we need to increase the supply of Proxeronine by regularly drinking Noni. Our bodies are bombarded daily by the damaging effects of free radicals created through normal metabolic functions. In fact scientists report that the DNA of each of our cells is attacked by the free radicals over 10,000 times a day. Free radicals make it impossible for the cells to function properly . Many chronic conditions including aging - are believed to result from accumulated damage caused by free radicals. 1. They can prevent a free radical from forming. 2. They can interrupt an oxidizing chain reaction to lessen the effects of the free radicals. 3. Antioxidants can reduce the free radical's impact. Noni as an antioxidant help neutralize the effects of free radicals, allowing the body to restore itself to proper balance leading to health and well-being. Scientists only recently have discovered that there are actually two COX Enzymes : COX1 and COX2. Research shows that in the body, the COX2 enzyme is largely responsible for causing pain and inflammation. Injury, disease and trauma cause COX2 Enzymes to produce prostaglandins, which cause pain and inflammation. In contrast to the COX2 enzyme, the COX1 enzyme is responsible for protecting the body's stomach lining and kidneys. COX1 enzymes continually produce protective prostaglandins. When taken over long period of time, traditional medication for chronic pain and inflammation by way of Non-Steroidal Anti-inflammatory Drugs (NSAIDs) like Aspirin and Ibuprofen, inhibit the enzymatic activity of both COX1 and COX2. This inhibition of the COX2 enzyme reduces the prostaglandins that causes pain and inflammation throughout the body, but over time it also restrains the COX1 enzyme from producing the prostaglandins that protect the stomach lining. This can result in major problems, such as ulcers and colitis, in the body's digestive system. 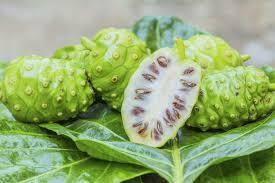 According to researches Noni selectively inhibits the COX2 enzyme while allowing the COX1 enzyme to continue functioning. Noni's effect on cancer most likely deals with the fact that both Noni and Cancer work on a cellular level. Proxeronine and Damnacanthal are substances within Noni that are believed to be anti-cancer agents. Noni contains scopoletin which has been scientifically proven to dilate blood vessels resulting in lower blood pressure. A second reason that many use Noni for high blood pressure is that Noni helps stimulate the body's production of nitric oxide, a chemical which allows the blood vessels to dilate more easily and be more elastic.